Developed to give lighter and sportier engine characteristic. By reducing the overall weight (and inertia) of the pulleys, and by modifying the alternator pulley ratio to take advantage of the more sporty use, the burden on the engine is reduced helping to improve acceleration performance. 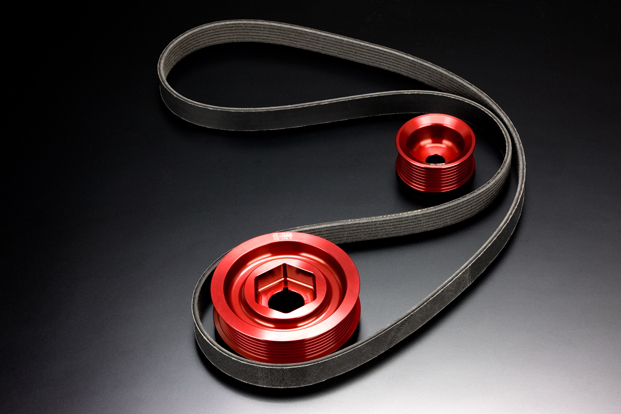 Installing with a new belt is important to help improve the running in process of the new pulleys. A good affinity material is used on the oil seal face of the crank pulley to reduce friction improving sealing and to reduce wear. 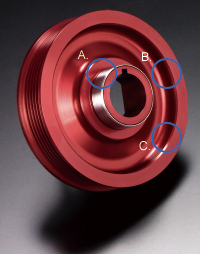 The hexagon socket design of the original crank pulley is retained so that Honda's service tool can be used when loosening or tightening the crank pulley bolt.